Black Squirrel Radio is Kent State University’s student run radio station. Since 2005, BSR has provided Kent State students with the opportunity to let their voices be heard over the air. 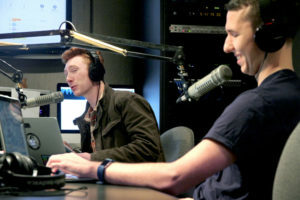 Black Squirrel Radio has 56 radio shows a week during the fall and spring semesters. Each show is run by student DJs which gives them full (within reason) creative control of what goes on during their show. Shows are two hours long and (usually) follow a specific theme. We’ve got everything from Sports, conspiracy theories, sketch comedy and even Korean Pop music. We air online which means you can listen to us anywhere in the world, whether that be Kent, Ohio or Komatsu, Japan. 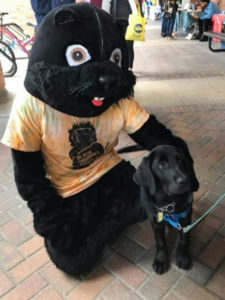 Beloved BSR mascot, URL the squirrel petting a four legged friend during Kent State’s Black Squirrel Festival. In addition to radio programming, BSR has a Web Staff of dedicated student writers, photographers and videographers that create content including album and concert reviews, interviews with local artists and anything else music or pop culture related. If you have any inquires about BSR or are interested in joining our staff, please contact General Manager Brooke Forrest.